Greek yoghurt contains high concentrations of probiotics which improve digestion and increase your immunity. This thick and creamy food is also a good source of protein and calcium. 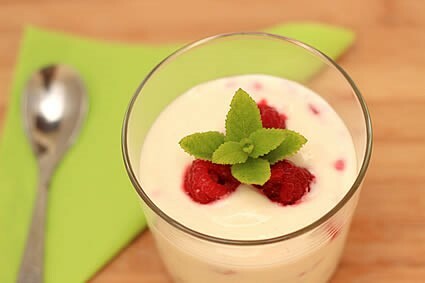 Mix your Greek yoghurt together with some juicy berries such as blueberries or raspberries that are rich in vitamins, antioxidants and fibre and you get a highly nutritious breakfast or lunchtime snack for kids free of artificial flavourants and colourants. 1. Place the yoghurt into a blender. 2. Sprinkle over some frozen raspberries. 3. Add the honey (optional). 4. Blend the ingredients to a smooth consistency. 5. Pour into a lunch box container and seal the lid. 6. It’s best served chilled, therefore I recommend you keep the yoghurt filled container in a small cooler bag lined with an ice brick.